I consider it one of the most incredible honours whenever a fellow wedding vendor reaches out to ask me to be a part of their wedding. I’ve had the distinct pleasure of being a part of several this year (this one was a major highlight!) and have a few more next year, as well. Today’s bride, Austin (the lady behind the camera at Austin Kylie Photography), is a little more special than other wedding vendors because I’ve also known her for most of her life! 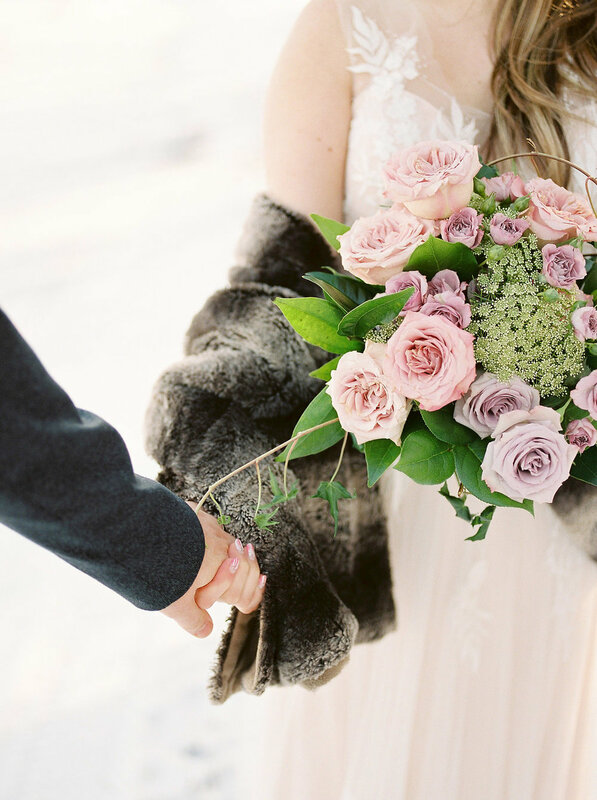 Her sister and my sister are best friends (you can see her gorgeous winter wedding here!) and it’s been really cool to watch her develop this talent with photography and have the chance to work with her on several weddings. Anyways, Austin’s wedding was such a delight to be a part of! 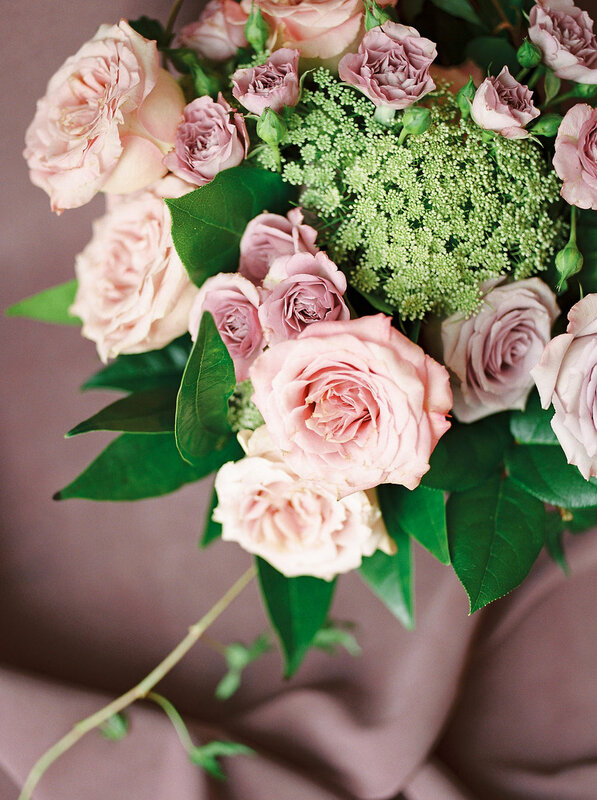 She has a fairly romantic, feminine style and right away she selected blush and gold tones. I suggested that we add in some berry tones to add depth, and it all came together really beautifully. 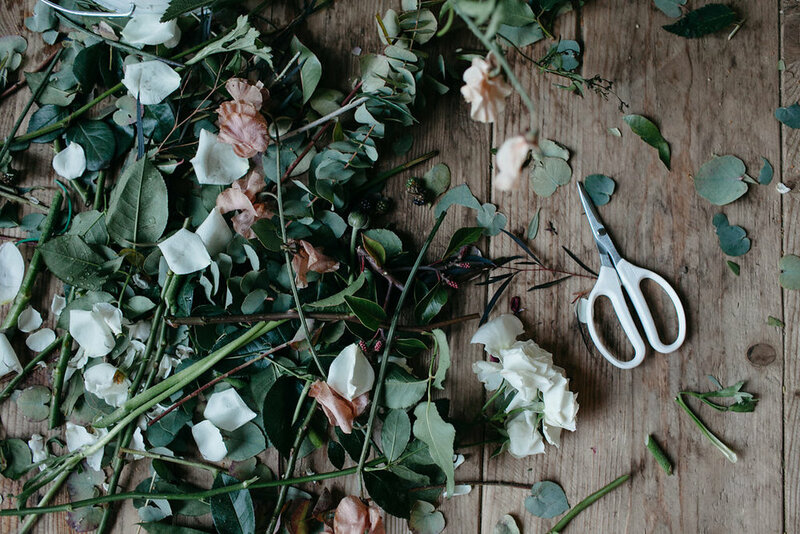 Bridal Bouquet Ingredients: Peonies (the MOST gorgeous peonies of the year!! ), quicksand and amnesia roses, white bleeding heart (from my garden and the perfect little touch! ), tulips, scabiosa, fragrant sweet pea, with ninebark and eucalyptus foliages. We finished the stems with trailing Stella Wolfe hand-died silk ribbon. The bridesmaids carried petite versions of Austin’s bouquet with a simpler shape, which complimented their range of dresses really nicely. Sometimes when you’ve got a mix of different styles, textures, and fabrics like these bridesmaids did, it’s better to go a little simpler on the other elements! Austin had her two Oma’s acting as flower girl, which is probably THE sweetest thing I’ve seen. Just look at these ladies! How adorable! For decor at the church, we started with an arch with a floral garland hung asymmetrically across it, and added on two large altar arrangements on thin gold stands. It created a lovely focal point in an otherwise fairly plain church, and were all pieces that could be re-used at the reception as well. The Human Rights Museum is pretty dark, which can make taking photos challenging but it also creates a fun ambiance. 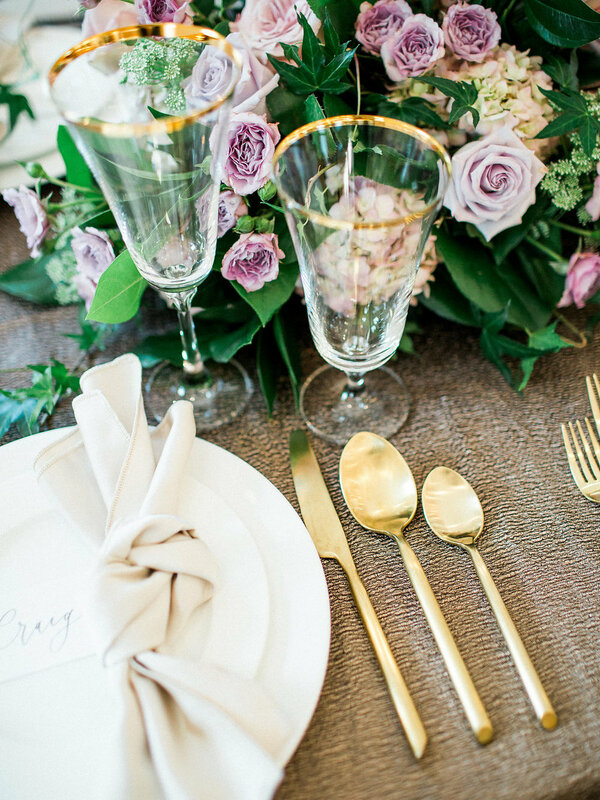 Austin selected to upgrade to gold chivari chairs and champagne toned linens, with a few sequinned gold linens for the family and bridal party tables. 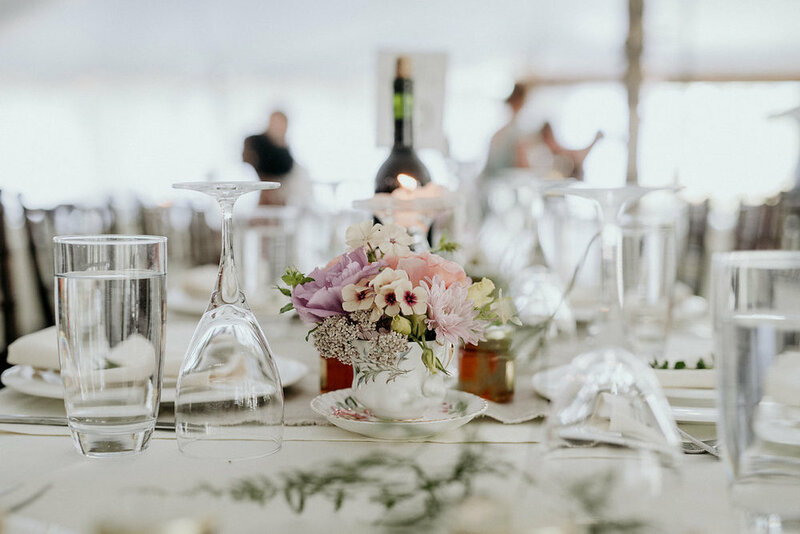 We chose three different centrepiece styles - a trio of stem vases with petite arrangements, the second a collection of candles with a rose petal base, and finally, a fuller floral arrangement with gorgeous berry pink peonies in a low gold vase (obviously these were my faves!). Limited wedding dates remain available for 2019 - click below to check your date! 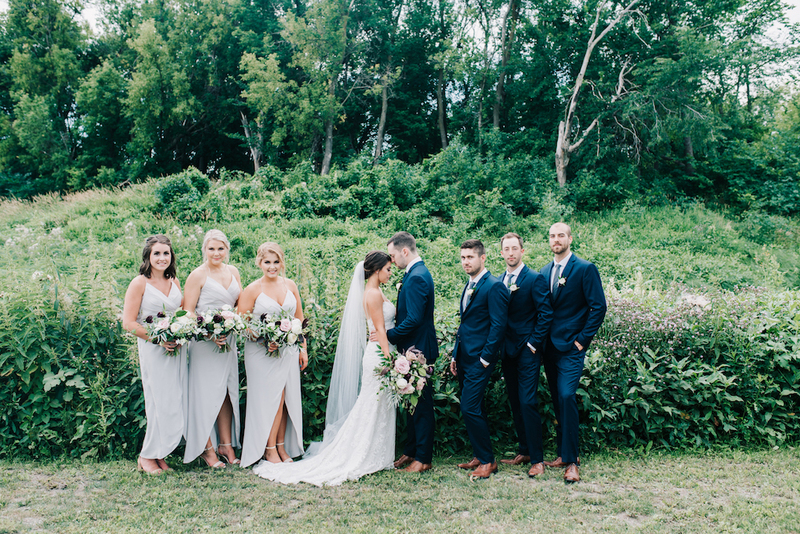 Emily made such a beautiful bride, and has such great style - as evidenced in the romantic wedding at Pineridge Hollow she planned for herself and Adam! One of my favourite things about their wedding was the palette I got to work with: light but still moody, elegant, and somewhat dramatic. Neutral but still interesting! And I LOVE that Emily chose a soft, dove grey wedding gown! Bridal Bouquet Ingredients: Earl Grey rose (such a lovely, delicately tinged rose that's almost white but is slightly grey/lavender), plum ranunculus and scabiosa, locally grown anemones, iris and foxglove, yarrow, stock, and sweet pea along with mixed foliages including foxglove and Israeli ruscus. The freckles on the foxglove worked as the perfect transition between the softer tones and the plum, and the addition of the peachy pink yarrow and the stock just added some more femininity. The locally grown iris was a last-minute find at my wholesaler that I'm sure I'll never be able to get again, and technically I hadn't budgeted for it but I just had to include it! It was the perfect shade of softest blue that tinged more towards the grey and was perfect with her dress. I finished the bouquet with trailing grey ribbons, in silk and pleated satin. I loved this bouquet! Emily also asked for a floral crown for herself. I made it with soft pink and white spray roses and yarrow, and it looked really lovely on her. It just added to the feminine, romantic vibe she was going for. The reception was at Pineridge Hollow. 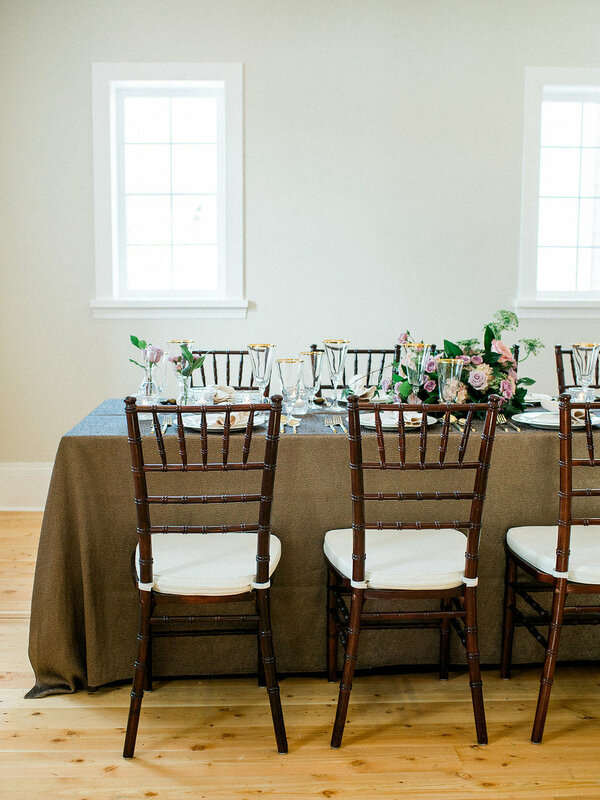 Emily chose long tables (if this is the way you go, just keep in mind that their tables are very narrow!) 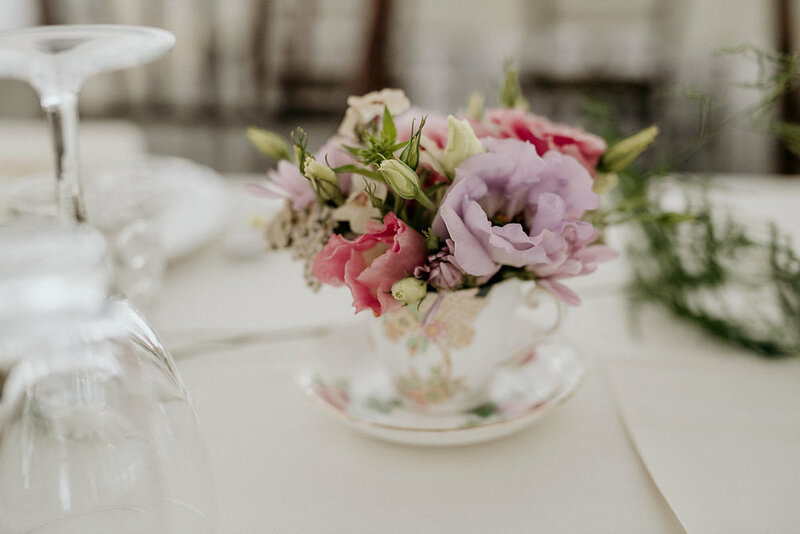 and collected a variety of mismatched antique china teacups for centrepieces. 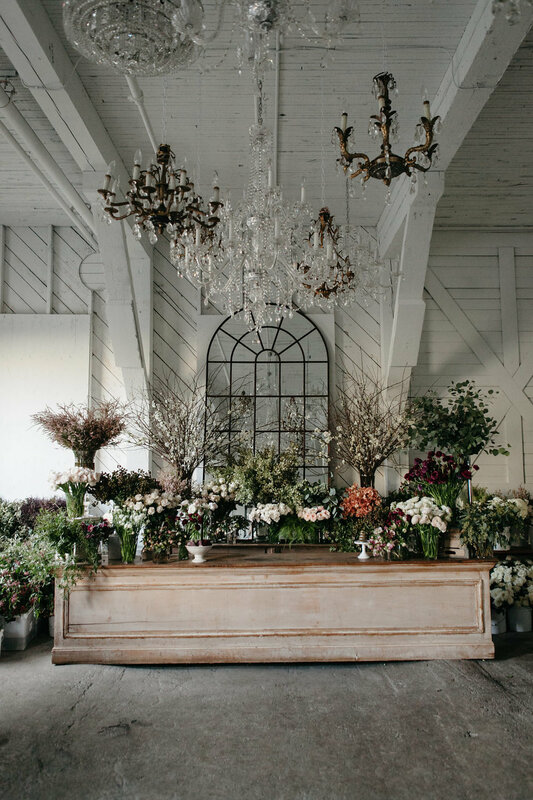 I loved the petite arrangements that I got to do in them - soft pinks and lavender tones, with mostly locally grown flowers. A bonus to this day was that I ran into my sister and her daughters while setting up, and my little nieces so desperately wanted to help me set up the wedding! It was the cutest thing - my 4 year old niece Penny went straight to my flower box and started pulling out centrepieces and carrying them over to tables. Not to be outdone, 9 year old Lily very quickly came to my aid as well! Buttercream by Alareen provided the cutting cake, and I had so much fun adding the fresh flowers to it. This picture below is a little sideways - the flowers cascaded down the front, with ivy trailing with them. Every baker has different preferences about whether or not they want to add the flowers themselves to the wedding cakes, but I'm perfectly happy to do it. I'm totally comfortable making the stems foodsafe and I'm a bit paranoid when it comes down to it - I don't want any flower "juices" making their way into your delicious cake, let alone any chemicals that might on the blooms themselves. 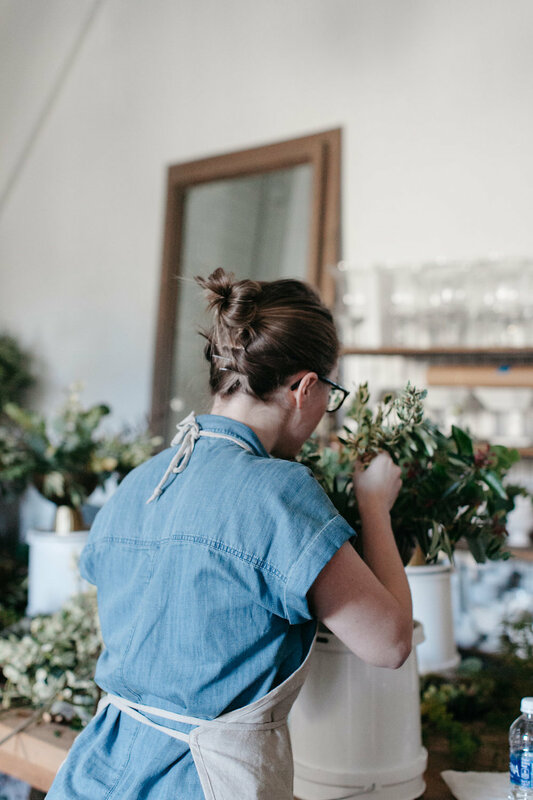 I make it a goal to always be learning new techniques, meeting new flower friends from around the world, and expanding my floral knowledge so that I can always be serving my brides and grooms better. This past February, I headed down to Seattle to attend the workshop of a lifetime, with Sinclair & Moore. I had the most amazing time - not only was it already spring there (such a treat! ), but alongside the very beneficial learning that we attendees got to do, we also got to be a part of an amazing wedding. Our workshop tuition went towards blessing this couple with the wedding of their dreams, and being a part of the team that got to put it all together was phenomenal for me. But, more will come on the wedding another day! In the meantime, here's a look at our classroom sessions and some of the pieces that I put together. Photos by Kate Price Photography. Steve and his team had thoughtfully put together this beautiful gift box for us, welcoming us on our first morning. Monogrammed aprons, samples of silk ribbon from Tono & Co, and delicious French macarons were such a wonderful surprise. 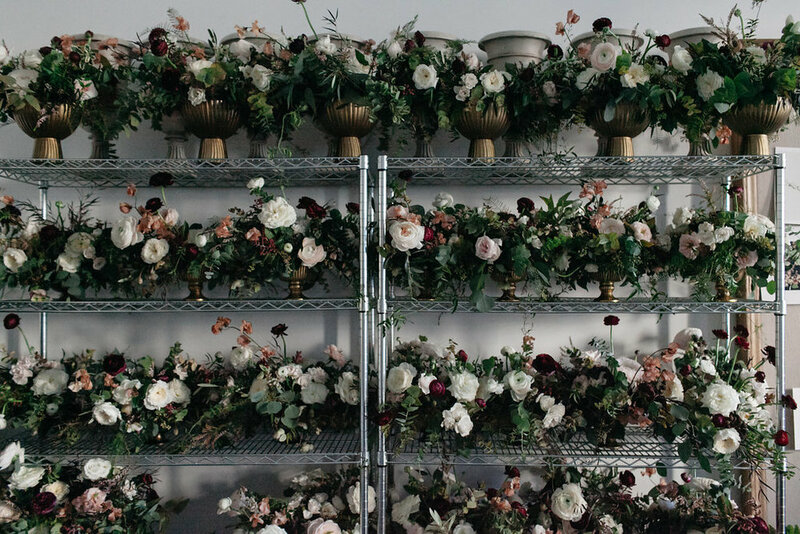 Above is the inspiration board for the wedding we worked on, and below is a rack filled with centrepieces that we created! 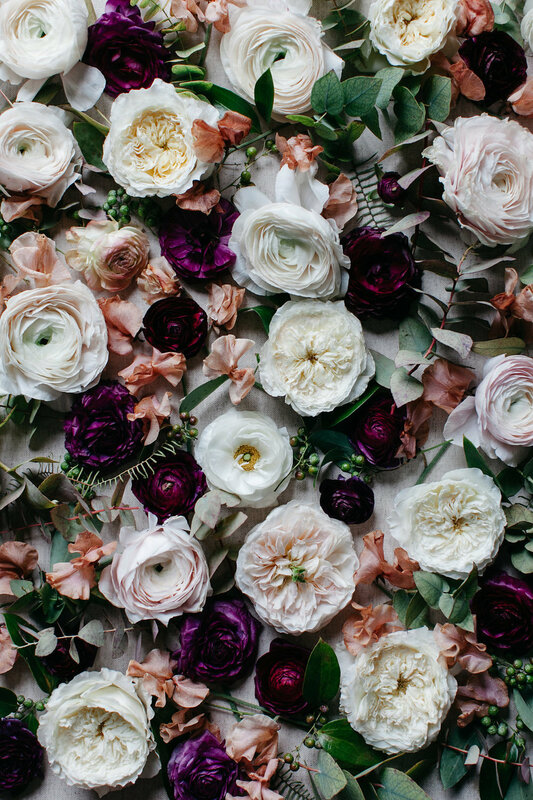 We each worked on two different styles of arrangements, all in this delicious palette of dusty rose, mauve, mocha, cream, and burgundy. 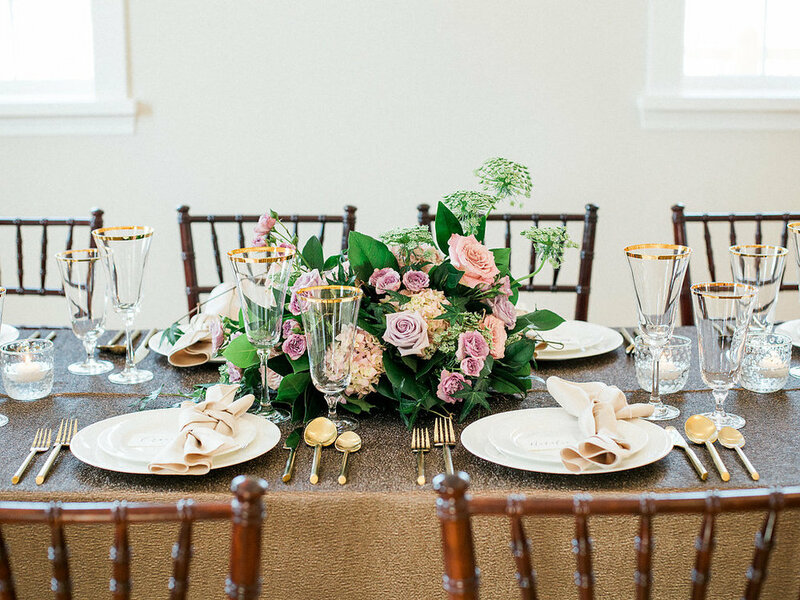 Delicate accents of terracotta toned sweet pea were the perfect finishing touches. I'll be sharing more soon from the wedding itself - can't wait to show it all! We had quite an amazing time and designed some very breathtaking pieces. By the way, i'm now booking for 2018 weddings! I love working with creative couples who want something different for their wedding than what their friends have had. I'd love to hear from you and find out more about your wedding plans!